Whether you’re new to Girl Scouts or have been in it forever, you’ve probably spent a lot of time exploring the outdoors and a lot of time making art. This is your chance to bring art and the outdoors together—to get inspired by the beauty in nature and use that inspiration to get creative. Roll up your sleeves and dive in! 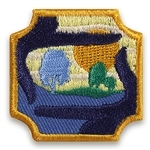 For the second year in a row, this new Outdoor badge was selected through the Girl Scout “Girls’ Choice” process. Girls cast their votes and selected the badge topics and designs, making the process girl-led from top to bottom. Iron-on. Twill with embroidery. Polyester. Imported. 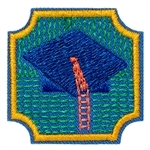 Click here to purchase the requirements to earn this badge! The years after high school are an exciting time—you’re going out into the world and figuring out what your adult life is going to look like. Some people will go to college right after high school, and some will take different paths. If you’ve decided that college is the best choice for you and your family, you may be feeling both excited and overwhelmed. Simplify the college preparation process by tackling it step by step, and you’ll be ready to start your next chapter in no time! Iron-on Badge. Imported. Iron-on Patch. Imported. Iron-on Patch. Imported. Iron-on Patch. Imported. Iron-on Patch. Imported. Iron-on Patch. Imported.